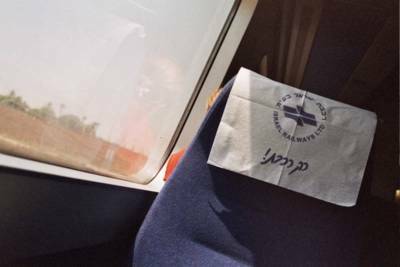 OK, so I was sitting on the train from Jerusalem to Tel Aviv, snapping random pictures because I needed to finish the roll, and, well, I just like the way this one came out. I like the way some symmetry is created by the diagonal line in the middle, and the way you can just barely make out the reflection of the woman who was sitting in front of me, transposed onto the Israeli landscape and sky. For those wondering, the cloth on the headrest says "Only the Train!" and "Israel Railways Ltd."
More recycling bins! In case you can't make it out, on the left is a window with a laundry line in front of it. I love the way these are side by side. 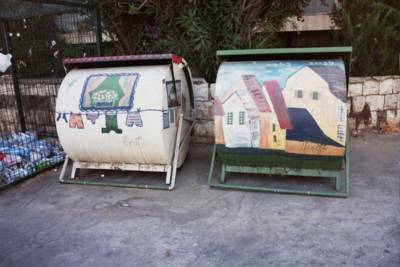 I snapped this pic in northern Katamon somewhere, on my way home from interviewing someone on Charlop Street. 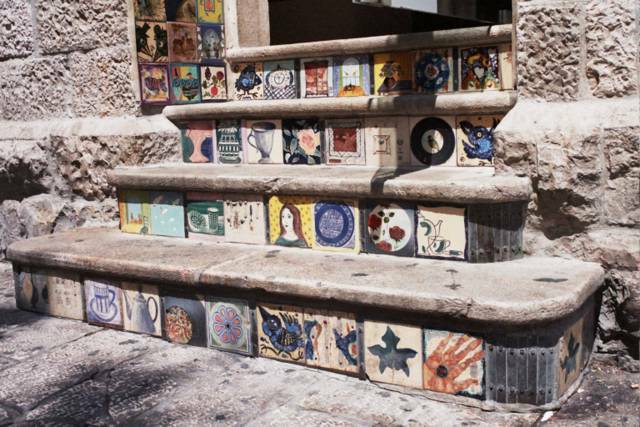 I recently went out for lunch in Jerusalem's City Center with Sarah Smile, and on the way back to her car we passed by a shop with this beautiful staircase leading up to it. This tilework is just gorgeous. These are the sandals (and one pair of flip-flops) I bought a couple of weeks ago at the Malcha Mall. The two on the right are the same style but in different colors. One thing I have to say for the Israelis is that they sure make available a wide variety of extremely comfortable, well-made, and often stylish sandals for the desert heat. This is one of the pairs of sandals I bought a couple of weeks ago. These are definitely the highest heels I've ever owned, but they are surprisingly comfortable. The angle of the heel isn't as high as it seems because the toes are on a platform. Ahhhhh . 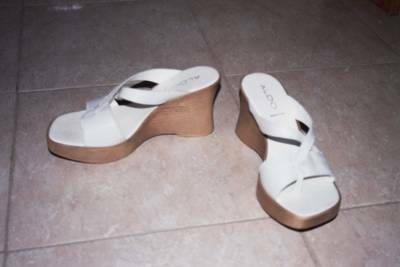 . . beautiful leather Italian-made wedge sandals. Purchase inspired by Manolo's Shoe Blog. Yesterday I had to go to TA for a work-related matter, and afterward I met Lisa for a coffee-klatch. It turned into a 3-hour lunch date! Amazing how two bloggers who are so different can get along so well. She is one fabulous chyck. For those following Lisa's blog: Nyah nyah nyah, I got the whole story about what happened in Tokyo and how she ended up back in Israel. I know more than you do. Nyah nyah nyah nyah nyaaaaah nyah. Onto another matter: Some kid on my street has been learning to pluck out various religious and Israeli standards (hatikva, shalom aleichem, kol haolam kulo, al kol eilah) on the piano. At first I thought: How nice, to hear these classic and clean tunes as I go about my day. But after a week of hearing these songs played one note at a time by a small finger somewhere, I got really sick of it. At last, today, the kid started playing chords. Yes, my street is very quiet. Nothing ever happens here, bli ayin hara, poo poo poo. If you want glamour, try Lisa. If I had more time, I'd create cogent posts about . . .
1) Why I'm pro-disengagement. It's been bugging me that while the anti-disengagement folks (God bless them, for most of my friends are among them) have very simple, straightforward, easily-explained (though often wrong) reasons for being against the Gaza pullout, I haven't heard so many arguments, well-reasoned or not, from my own side! I know why I believe what I believe, but I don't hear so many other people echoing my thoughts. This may be because I live in Jerusalem and frankly don't usually bother arguing with people about their political views. It is possible that there are closet lefties right in my own peer group who, like me, just don't want to ruin our Shabbatot by getting into political arguments. I usually let my friends at Shabbat meals go on and on about how horrible and unreasonable the disengagement is, knowing that eventually they will start talking about something else and I'll have some peace and quiet. Pass the brisket. Until Friday night. A friend and I were invited to the home of a wonderful, wonderful couple who often invite over large groups of singles. They are incredibly warm and generous. Also, they are very actively involved in the anti-disengagement movement. Conversation among the 10 or so guests proceeded with most people obviously assuming that everyone at the table is of like mind. Finally I spoke up. I explained why I think that leaving an important security issue up to a referendum would be a bad idea, and started in on why maybe disengaging isn't as unreasonable as they believe, when I ran up against a wall because there was information they had against my argument that I hadn't known. So I was stymied, trying to think about what to do now, when others changed the subject and I gave up. On the way home, my friend, who happens to be far more pro-disengagement than I am, said "that was brave of you, Sarah. I never would have had the guts to speak up." She then told me the information I'd needed in order to counter-argument. I'm a bit peeved that she didn't help me out by providing that infomation at the table when it would have helped me, but understand why she didn't. Sometimes, you just want to eat your brisket. But if I had more time, I'd explain it all here, my extremely unpopular-in-Jerusalem pro-disengagement sentiments. 2) Noa and Bryan's wedding. It was beautiful. 3) My afternoon at the Sulha. See Jewlicious for a good description. We seem to have attended the same workshop. I had a couple of very nice, warm encounters with Arabs - one a Bedouin from the Negev and one a Palestinian from Bethlehem - but like Laya at Jewlicious I was disturbed that the workshop on forgiveness we both attended did not include any acknowledgement from the Arab side that perhaps they need to take responsibility for those elements of their culture that allows terrorism and suicide bombing to grow and continue. The cynics were right: All I heard at this particular session (which was, admittedly, only one out of dozens which took place over three days) was Israelis apologizing for causing pain through the occupation, and Palestinians saying "we are trying very hard to find it in our hearts to forgive you." Perhaps that happened in other sessions, but not the one I attended. Perhaps I will write more later this week about my conversation with Abdullah, the Bedouin man. He was really very nice and had fascinating, very love-and-peace-oriented, political views. I wish him well. My overall impression: The Sulha is very nice as far as it goes. I'm not so sure it goes very far. Still, one never knows what kind of ripples might be created by a small break in the water's surface. 4) How much better my Hebrew has gotten. At the Sulha I translated for Abdullah and an American college student for about half an hour. And recently I yelled at someone for five minutes, just ranting in Hebrew, the words flowing out without stopping! Some time in the last few months, something just "clicked" in my head. I think really it's just that I stopped worrying about making mistakes, and started just talking without worrying about errors. All of a sudden, the Israelis started complimenting me on my error-laden language skills. It can't possibly be that I know so many new words; I work all day in English and hardly know any native Israelis. Alas, I have way too much work (thank God, actually), so the post stops here. 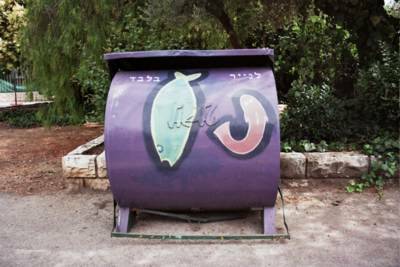 In response to my last post about the wonderful recycling bins in Jerusalem: I have absolutely no idea who initiated this project. I tend to think it was the city, but who knows? Perhaps one of these days my curiosity will get the better of me and I'll call city hall to find out for sure. 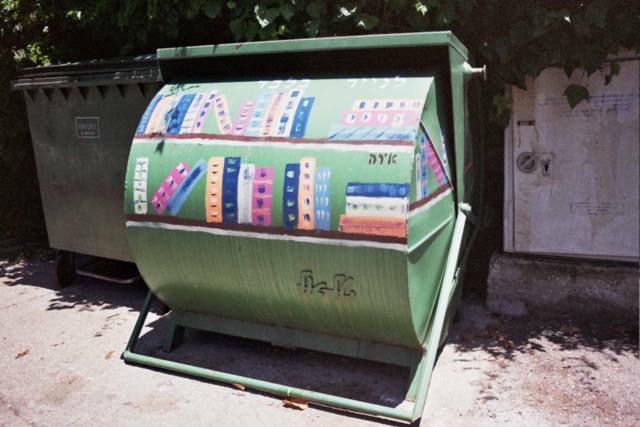 All I know is that the bins used to all be green, and one morning I woke up and all the ones in my neighborhood had different paintings on them. 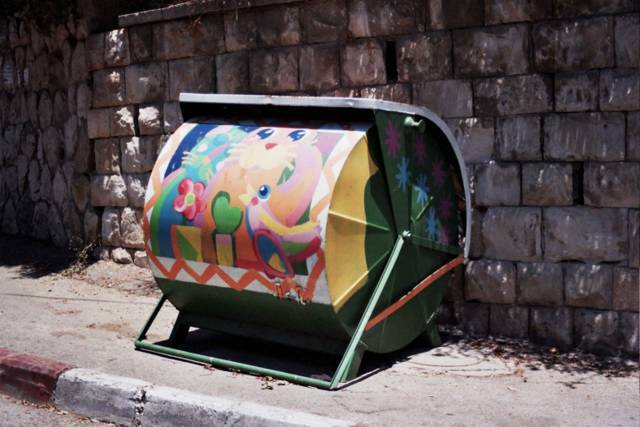 And within a few weeks, every bin had a painting, at least in the neighborhoods near me. 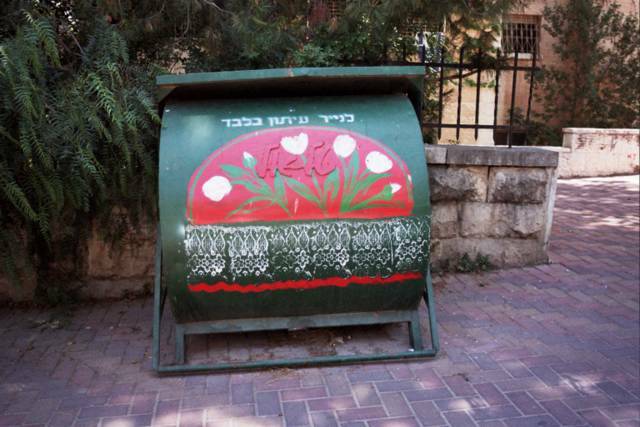 1) I am not sure that all areas of Jerusalem have recycling bins at all. 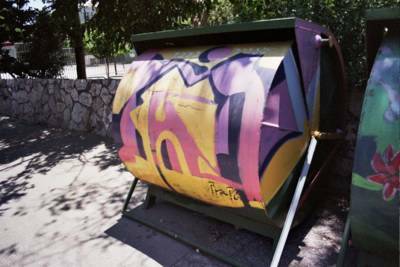 I have heard that recycling is something that was instituted in certain areas . . . whether because they are wealthier or because of the influence of North American immigrants, I'm not sure . . . 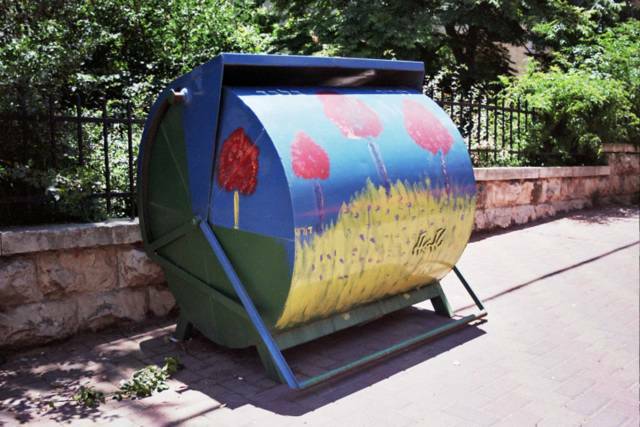 I'd be interested in having readers from north Jerusalem or other Israeli cities leave comments letting us know whether you have a recycling program and, if so, what color the bins are! Thanks to a tip from The Hedyot, here's a link to a Jerusalem Post article about the recycling-bin artwork. Yes, it is a municipal project. Kudos to the artists. 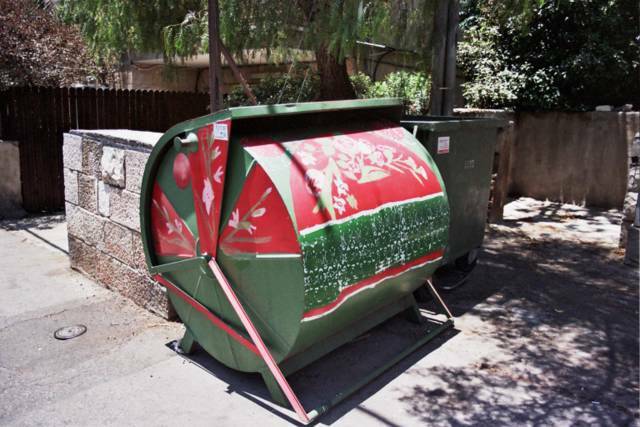 2) Not once have I seen a recycling bin that has been defaced. No graffiti. In New York these paintings would last for about 3 minutes before being ruined. And now, on to my last (for now) batch of bin-spotting photos . . . I don't remember where this particular bin is located. When I first saw it I was like "this is dumb." But now that I'm looking at it more, there is something rather dramatic about it, especially the evokation of deep water in a city located in the desert. A couple of months ago I discovered that the young students at Machon Gold had painted this Jerusalem "landscape" onto the wall in front of their school. 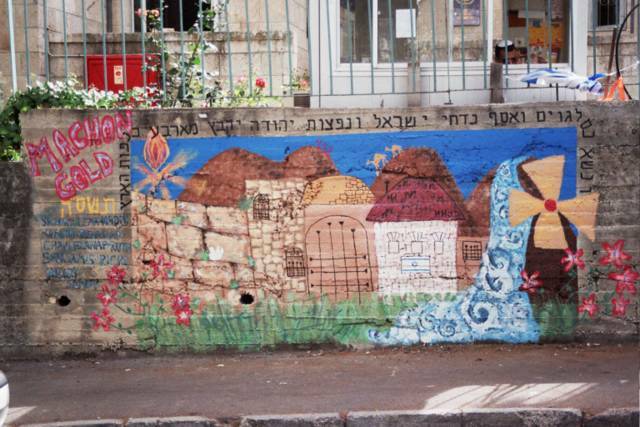 On the side, under the words "Machon Gold" is a list of the girls who contributed to the painting, and along the top is a verse about the ingathering of the exiles. Here is the second of the pair next to the park at Beit Elisheva. I just love the colors on this one, don't you? My date tonight with He Who Always Calls When He Says He Will Call, henceforth to be referred to as R. (for "Reliable"), has been cancelled due to protests against the disengagement. All I know is that he was working yesterday until 2 am, and is now somewhere near Gush Katif "not going anywhere anytime soon." With 26 days left until the scheduled pullout from Gaza, I am now taking bets in the comments section for how many times I will be able to see this man in person between now and mid-August. My guess is 2, if I'm lucky. But really, it might be zero. 1) Saturday night I picked up my copy of Harry Potter and the Half-Blood Prince, and read the whole thing between the hours of 10 pm and 10 am the next morning. It was a killer staying awake on Sunday, but it was worth it. This was definitely a very good Harry Potter book, much much better constructed and edited than Book 5. And that's all I'll say for now, so as not to include spoilers on my blog. 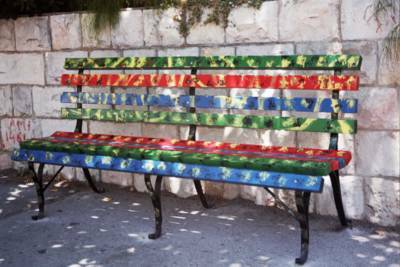 2) For those who are free, starting tomorrow there is a 3-day peace festival (the annual "Sulha") in a park near Petach Tikva. I was told that the activities start at 11 am, and go each day into the after-work hours (ie if you work, you can still go in the evening and there will be stuff going on). Last year, during the day there were workshops that allowed Jews and Arabs (both Israeli and Palestinian) to talk to each other and share their stories, and in the evening that I was there, was a concert. I was there to cover it for the paper, but actually really enjoyed it personally as well. My reason for wanting to go this year (other than wanting to cover it again, of course) is this: Everyone (well, a lot of people I know, anyway) complains that there can never be peace with the Arabs because the Arabs don't want peace. But the Arabs showing up to a peace festival are the Arabs we want to talk to. I think it's important that people show up. Do the organizers have their heads in the clouds? Maybe. But you know what? It's a really, really nice event. It's nice to know that someone is doing something like this. May as well enjoy it and take a break from all the depressing stuff. Here are the directions I was given to get to the Sulha: Take the train to the Segula station (near Petach Tikva - 14 minutes from Tel Aviv). From there, get a taxi (in order to avoid crossing a highway on foot) and ask the driver to take you to "mekorot hayarkon." This is near "kfar habaptistim" (Baptist Village). It's like a 2-minute drive. Hopefully the driver will know what that means. If not, tell him you want to go to the Sulha and that might help. The event is going on tomorrow, Wednesday, and Thursday (it was originally scheduled for August, but moved back so as not to coincide with the disengagement from Gaza). 3) Speaking of the disengagement, I'm supposed to go on a date with someone who is a career officer in the Israeli Army (a.k.a. He Who Always Calls Exactly When He Says He Will Call), and it's almost impossible to find times to meet because he's working about 29 hours a day on the pullout. I should note here that he is strongly against the move, so in addition to working impossibly hard he is also doing work that he hates. But what I want to say here is that while I may still be "thinly pro-disengagement," Ariel Sharon's bright idea is now interfering with my love life. Now, it's personal. Of course, the anti-disengagement protesters are interfering as well. When I saw in the news that the army was going to be busy dealing with a huge march into Gaza this week, I thought "No! No! Don't protest! If you protest I'll lose a date night!" However, I handled it with class and was very proud of myself for how much I actually didn't care. We said all the necessary pleasantries and then I moved on with my life. Wow. I'm healed. Amazing. 5) Mazal tov to Carla Moy and Marc Lerman on their recent wedding. I met Carla and Marc at UYO in Connecticut last October. They love UYO so much that they got engaged at the course! They are very nice people. May their life together be long, healthy, and full of only sweet things. 6) And speaking of UYO, the Israel course has been postponed until January. A lot of people wanted to come, but almost everyone said they can afford it only if they pay in installments. So, we are pushing the date back in order to allow more people to be able to come. It's all for the best. Now there's something big to look forward to this winter. 7) I am addicted to Israeli-style ice coffee. It is so cool, frosty, and delicious. And very very fattening. And very very ubiquitous. 8) Update for the benefit of my friends in the US: I got my hair cut quite short. It looks good. There is a new stylist around the corner from me, and I noticed that the day he opened he already had a lot of customers; they followed him from his previous place. Very good sign. So I tried him and he did a really good job. Sorry, no pictures on the blog. That's it for now. 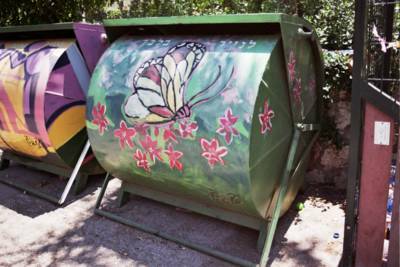 More recycling bins coming soon. More of Jerusalem's Recycling Bins! A few weeks ago, on a scorchingly hot day (like today), I wandered around the northern end of Old Katamon, taking photos of the recycling bins as I headed southward. Below are some of the photos I took that day; I plan to post the rest tomorrow. Feel free to post your comments about the artists' handiwork. 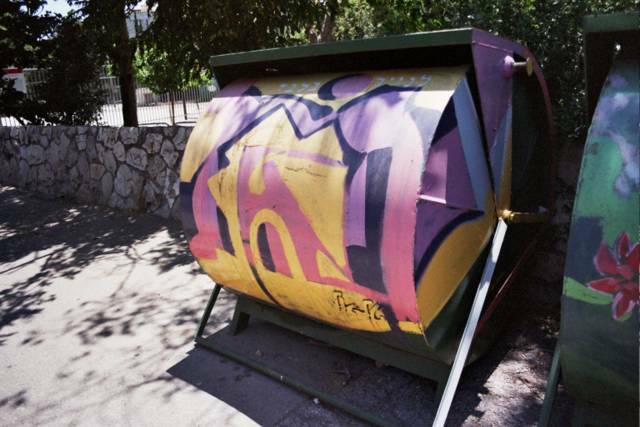 No two bins are alike! Here we have pink tulips on a red background, on Hapalmach Street. I love the way some of the artists go to the trouble of painting the side of the bin as well as the front (I don't always get that in the pictures, but the decorations are there). 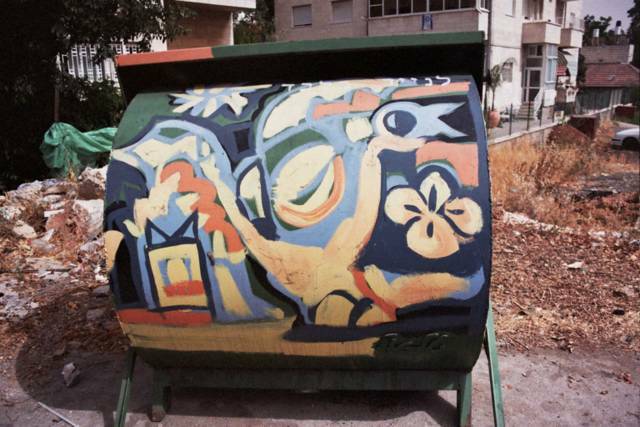 I think this one was done by the same painter as the one on Hapalmach street. Nothing like white tulips to brighten one's day. If I recall correctly, this one is on Gedud HaIvri street. These are red trees growing out of what looks like wheat or yellow grass. Quite cheerful colors, eh? Ah, books! But I hope no one throws any of THOSE into a recycling bin. OK, so it's not a recycling bin. It sure was nice of whoever went to the trouble of painting this bench on the street. It's a happy-happy bench. Last week, I plugged my laptop computer in, as usual, to recharge the dead battery. Several hours later I came back to it, pushed the power button, and nothing happened. Nada. Black screen. Nothing lighting up. No power anywhere. Over the next day or so, I kept trying, and finally had to admit that something was very wrong. The computer was not responding at all. I called Tech Support in the US, and they had me do various things to test the battery, and finally determined that the AC Adaptor/power supply is broken. Since I bought the computer only 4 months ago, they sent me a new power supply in the mail (well, they sent it to my sister in California, who then sent it to me). Meanwhile, there were certain files I really needed to access. I posted an ad on a listserve for English-speakers in Jerusalem, asking if there was anyone out there with a Dell Inspiron who would allow me to borrow their power supply just long enough to recharge my computer so I could email certain files to myself. I got a few responses. Among those was a woman just a 10-minute walk from me, who said "I'm going away for Shabbat, but my aunt and cousin will be here. Call my aunt on Friday, and arrange to pick up the power supply. Then bring it back after Shabbat." This was very nice and trusting of her, I must say! Meanwhile, on Thursday night, I hosted a small seudat hodaya (Thanksgiving meal), for a few of my old, close friends from the US (Beth and Simcha, Ari and Sarah Beth, Chava, Yael) at a wonderful Italian meat place called Ragu. It was in honor of the fact that I'm out of debt, and in particular the nice windfall that came out of nowhere and allowed me to pay off all my loans. I was saying during the meal that I can't think of anything I've done in the past to deserve such a gift, so I'm making the seudah -- and hopefully will do other good things in my life -- so as to retroactively have deserved that financial windfall. We also talked about my gratitude that I have just hit (yesterday) the 2nd anniversary of my immigration to Israel, and thank God, my life is going great. I've paid off my loans, my work is going well, I live in a nice apartment, have good friends here, and just started level vav (the 6th and highest level) in a once-a-week Hebrew-language program. Not bad. Not bad at all! When I got home from the seudah, there was an email from a childhood friend I've been looking for, on and off, since around 2002. We hadn't been in touch for 22 years. That day she'd Googled herself and found my ad on "Almost Met Jew," and wrote me an update of her life. There was also a rather more unfortunate email waiting for me after the seudah, from a former roommate letting me know that she'd just gotten divorced. Very dramatic things . . .
On Friday, I went to collect the power supply. I trudged through the oppressive heat and climbed up to the fourth floor, where I was met by the aunt and the cousin, only to find out that the power supply for the Inspiron 1600 has a different plug than the Inspiron 1150. The power supply was useless to me. Ugh! Since I was so hot and miserable, the aunt and cousin offered me a seat and cold water, and we talked. We talked for 45 minutes. They were oddly open to me about the problems in their lives. I told them some stories about similar problems I've had in the past. I was learning interesting things about human nature from talking to them, and felt that I had something to offer in terms of adding a different perspective. During the conversation, I also recommended the "Understanding Yourself and Others" class to the aunt, who lives in the US. She carefully wrote down the URL for the class' website. Soon thereafter, I realized that Shabbat was in about 20 minutes, and ran home again through the heat. On my way into the apartment, I was thinking "you know, it's really a bummer that their power supply isn't compatible with my computer. But I guess if the aunt takes UYO and feels better about those things going on in her life, then I was meant to go there today. Maybe Hashem arranged for my power supply to break so that I would end up meeting this woman who is in Israel from America." Given all the strange things that had been happening, I also thought "Wouldn't it be weird if, now that I've fulfilled that job of telling the aunt about UYO, my power supply was working again? That would be nifty and spooky!" So I plugged in the power supply to an outlet and to my computer, lifted the computer lid, and hit the power button. And the computer sprang to life. "What color is my bracelet?" For those who haven't been reading the life-in-Israel blogs, or following the news . . . Israel is planning to "disengage" from Gaza in about 7 weeks. There have been a lot of protests against this move, by Israelis who for religious and/or security reasons think that it's a very bad - nay, a disasterous idea. The official color for the anti-disengagement movement is orange. Everywhere these days are people - most young people - wearing orange t-shirts; hanging orange ribbons from their backpacks, their belts, their car antennas; and posting orange signs saying "Jews don't expel Jews." There is also the ubiquitous orange bracelet, in the same style as the yellow "Live Strong" bracelets in the United States. Eventually, those who were pro-disengagement had to choose a color of their own, and lately I've been seeing a few cars with blue ribbons waving from the antennas, and young people with blue and white streamers tied to their belts and backpacks. Not many - I do live in Jerusalem, after all, where the disengagement is immensely unpopular - but some. The debate is heated and very emotional. People on both sides just can't understand how anyone could think the way the "others" think. Here is the bracelet that I want: A band with interwoven orange and blue stripes or swirls, that says "Am echad im lev echad" - one nation with one heart. As a religious person, I think that Hashem would rather see His children working together peacefully and with love for each other, even if we were doing something He didn't like, than to see us do the right thing while hurling insults at each other and nails under each others' cars. We are arguing vociferously over whether cutting off our leg will save our heart. It behooves us to remember that no matter how passionately we disagree, that heart - our historic, familial, religious, spiritual, undefinable glue - beats for us all. I don't know whether disengaging from Gaza is the right thing to do. Perhaps it is the proper way for us to show that we do our geopolitical hishtadlut - put in human effort- in this world, rather than rely on a miracle. Perhaps my friends are right; perhaps there really is a clear mandate from the Torah that we must hold onto this land. Perhaps the attacks from Palestinians will get worse afterward. Perhaps this is the biggest tragedy, the worst mistake, in the history of Israel. Perhaps lots of bad things. Or perhaps lots of good things. Or perhaps some of both. But when I reach 120 years and stand in judgement before the Almighty, and He asks me "why didn't you work harder to show love for the land of Israel? Why did you stand idly by while your brothers made a monumental mistake?" I think I will feel comfortable answering: "Because I couldn't be sure whether they were really making a mistake, but I did know for sure that it's better for the Children of Israel to stand united behind a mistaken leader than to tear each other apart at the throats." "My other son is a doctor . . . "
Mazal tov to my second cousin, Ron, of Petach Tikva, who just got his acceptance letter from the Medical School of the Technion in Haifa, Israel! For those out of the loop, Israel has only 6 medical schools for all the many, many Jews who want to be doctors. Getting into one of them is not easy. Ah, my brilliant cousin! I see the smart genes run in the family . . .
From the other side of the security fence . . .
A beautiful post at House of Joy. Beth is always so real. Even about the disengagment. Even though she's a "born again Jew" and a "religious fanatic" (her words, not mine, I promise) and lives on a yishuv in a place where most people of the world would not want to tread. The last line in particular really speaks to me. Behold, the blogger article you have all been waiting for. And, behold yet again!, for a first-person blogger account by the Esthertainment Channel. Thanks to Esther, Esther, and Jewlicious for the links. More posts to come very soon. I have several ideas bubbling just under the surface, about to boil over.